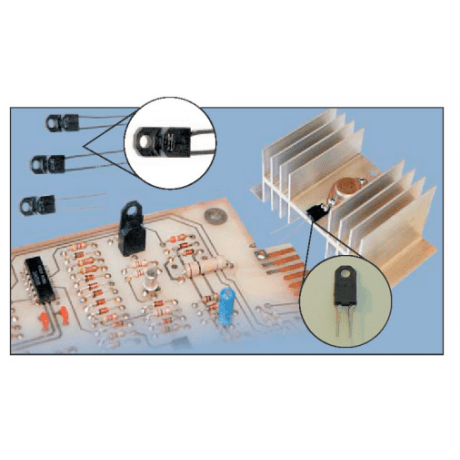 The Cantherm F20-E06 Encapsulated Thermostat for Electronics is now available with die cut PCB leads. JEDEC TO-220 critical dimensions, such as lead spacing, lead to back plane and board to mounting hole, have been respected to insure interchangeability. They will be shipped in 50 piece plastic tube magazines for ease of handling and loading for automatic insertion. Because of the plastic TO-220 style housing high voltage and high temperature applications (4000 VAC dielectric @ 200°C) can be achieved. The RYTON PPS plastic is UL94 V-0 approved and withstands long-term exposure to 220°C. Available with N/C or N/O contacts, PC mounting pins or flying leads in temperatures from 70°C to 160°C, the F20-E06 is suitable for most applications. Its small size and 3 amp current rating makes them ideal for today’s smaller higher watt density designs. The miniature size, high switching capability and versatility of its contacts make the JEDEC TO-220 compatible device ideal for printed circuit board mounting. The F20-E06 is epoxy sealed to withstand wave soldering and board washing operations. The CANTHERM F20-E06 has been designed to protect today’s technology and meet the requirements of tomorrow’s innovations. The F20 snap action bimetallic element will respond rapidly and accurately to changes in the temperature of the surface to which it is mounted or the air temperature in an enclosure. The single pole, single throw contacts can be configured as either normally open or normally closed, operating on rise in temperature. The average automatic reset will occur at a temperature approximately 20 – 25°C below the calibrated set point. The housing has been designed for demanding conditions such as high continuous temperatures and high voltage electrical isolation. The PC version is supplied with TO-220 style stamped lead-frame leads and are shipped in a 50 piece plastic magazine for ease of insertion and handling. The F20-E06 is available from 65°C to 160°C with either normally closed or normally open contacts. Increments are 5°C and standard tolerance is ±5°C. The F20-E06 is available for PC board mount or a variety of flexible wire leads. Standard leads are 6”, 24 AWG UL Black up to 3398 150°C and UL1180 Teflon up to the maximum temperature. ADD “-PC” to the part number for solid pins or specify flexible lead type. Other wire types, gauges and lead lengths available upon request. The thermostats are not current sensitive at rated currents. At loads above the rated values, up to maximum loading there is self-heating of the current carrying contacts. * When N/0 contacts are closed, self heating will occur at currents exceeding normal rating. It is possible that, given certain combinations of set temperature current & ambient temperature, the contacts will not reset. Temperature stepped in 5°C increments. Special switch-off and reset temperatures available on request. Rate of temperature rise from 0.1° C/min. to max. 1.0° C/min. Insulation of the housing will slow down the cutout’s response. We reserve the right to change specifications without prior notice. ADD – PC to part number for PC lead frame leads. It is the responsibility of the customer to insure that the devices descibed above are used in a safe manner and within published parameters.